Caroline “Car” was borne in Chakrata, India in 1873 – the middle of three daughters of Willingham Franklin RICHARDSON and Elizabeth Blew PYM. Willingham was a son of Sir John RICHARDSON, noted navel surgeon, naturalist and artic explorer. For family connections see genealogical records here. When she was not yet two years old, her father died and the family returned to live in London. Car studied art in Paris before teaching art at Bramley High School. Her uncle John Booth RICHARDSON was a painter and carver who had retired to Spilsby in Lincolnshire and her aunt Beatrice REYNOLDS lived in Thetford. Car must have visited both Lincolnshire and Norfolk, as evidenced by her paintings. She seems to have exhibited regularly in London. In 1910 at the age of 37 she exhibited fifty nine watercolours of English Country Scenes at the New Dudley Galleries in Piccadilly and in March 1911 and, “after a lapse of more than a year”, there was another exhibition of her watercolours of Lincolnshire at the Dudley Galleries. You can see the catalogue and press reviews here. Some of the exhibited paintings are available on this site. At this stage Car characteristically worked on tinted paper, usually grey. She later evolved a distinctive lighter sketchy style using pencil and wash on cream paper. She often included figures going about their activities – sometimes just an outline or allusion to the person. These are particularly effective in her depictions of town fairs and markets. 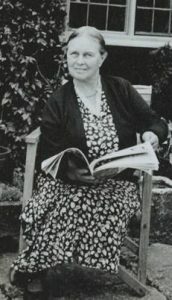 Her younger sister Mona had married and by 1910 Mona and her husband had built Ridge House in Quill Hall Lane, Amersham. Car and her elder sister Josephine were frequent visitors from town, no doubt aided by the development of the Metropolitan Line. At first they stayed opposite Ridge House in a shack known as The Woodhouse (now a substantial property) and eventually started to buy property in the area – Lavender Cottage on Chestnut Lane and Hedge Row on Quill Hall Lane. In 1915 they purchased The Old School House (then known as Downash). Included with it was a field that contained what was known as The Tithe Barn. They later adapted this as a studio and living quarters and Car lived there until her death in 1959. The sisters were quite celebrated in the area. For a cameo of their life in The Tithe Barn see The Richardson Sisters. Whist living in London, Car painted London scenes, produced Christmas cards, often of river motives, and the countryside (especially Buckinghamshire and Lincolnshire). She also painted during extended travels abroad. Her London scenes include remarkable sets of London bedecked with flags for several important occasions. During World War 1 she nursed or provided occupational therapy for convalescing soldiers and she sketched many of her charges, often including details of their regiment and where they were wounded. There are over one hundred of these sketches on this site. In the run up to World War 2 there was an appeal for artists to record old buildings in case they were lost. Car developed a particular skill in portraying the structure of old buildings which convey their character beyond what a photograph could achieve. She was concerned about the loss of old buildings and sometimes recorded a note such as “soon to to be pulled down for a new road”. In the 1930s she set about painting windmills in the east and south of England to record them before they were lost. A notable collection of over one hundred of these is available on this site. Many of them were indeed destroyed after she painted them. In 1942 she donated 38 of her paintings of Buckinghamshire buildings to what is now the Bucks County Museum. The museum has kindly made these available for inclusion on this site. They are indicated with [©BCM] and can be found on these pages.